Jeffrey Gundlach wouldn't be surprised to see Treasury yields leap to new multiyear highs before the bond market calms down. "If you look at the charts and you look at the way the market's behaving and you think about the trends that are underneath the bond market, it wouldn't be surprising at all to see the 30-year [yield] go to 4 percent before this move of the breakout above 3.25 percent is over," he said on "Halftime Report" Thursday. "The curve should probably steepen so maybe the 10-year Treasury makes it to 3.5 percent or 3.6 percent during that move," he added. This week, the 10-year Treasury note yield touched seven-year highs above 3.2 percent before easing off those levels. On Friday, the 30-year yield settled near 3.34 percent. Sentiment around the globe was rocked in recent sessions, as investors grew nervous over the rise in interest rates. President Donald Trump has recently criticized the U.S. Federal Reserve for the decline in stock markets, saying on Wednesday that he wasn't happy with how the central bank continued to raise interest rates. "The problem I have is with the Fed. The Fed is going wild. I mean, I don't know what their problem is that they are raising interest rates and it's ridiculous," Trump said during a telephone interview on Wednesday with Fox News. 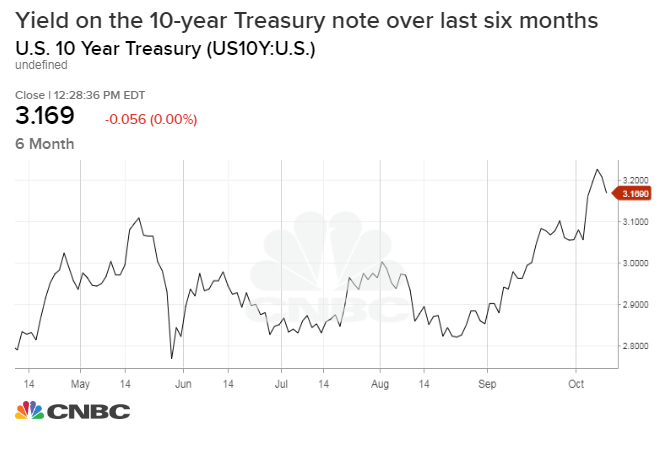 "One of the things that is really fascinating about this sell-off in bonds is that it's happening of the context of a really high short position against the Treasury market," Gundlach added. "With this sell-off you'd have thought that maybe it would be braked a little bit by all of that short positing maybe looking to take profits because rarely do you have this crowded positioning in a market and they're all making money on it." Gundlach is founder and CEO of DoubleLine. He is known for his investment acumen in the fixed income markets. DoubleLine has assets under management of more than $120 billion, according to its website. Treasury yields have soared in recent weeks as the Fed has raised rates and data has showed a strong economy, sending both the 10-year rate and the 30-year rate above multiyear highs, and beyond what the so-called Bond King dubbed a "game changer." The DoubleLine Capital CEO wrote on Twitter in September, "Yields: On the march! 10's above 3% again, this time without financial media concern. Watch 3.25% on 30's. Two closes above = game changer." --CNBC's Fred Imbert contributed to this report.